Welcome to My Carolina Lifestyle! Welcome to My Carolina Lifestyle, a blog all about the natural beauty and things to do in South and North Carolina. We’re a group of bloggers and lovers of the Carolinas. We’ll share the best travel tips, places to eat, drink and have a good time. Best of all, we’ll have travel guides for each area we cover – so you’ll always know what to do and where you can do it. Feel free to drop us a line if you are interested in us writing about a certain area. As time goes on, we’ll have a lot more to share about tons of different spots in the Carolinas. For now, we’re focusing on the beach areas along the Grand Strand and a little north into the corner of North Carolina. We plan on covering all kinds of attractions across the different areas. We’ll have things to do in every area above and more as we go on. Kick back and relax – we have a lot to cover. 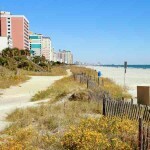 From attractions for the parties and clubs in Myrtle Beach to the family-friendly things to do in the Outer Banks, we’ll have it all. We accept posts as well – if you are interested in writing for us, we do have strict guidelines on the content we post, but are open and welcoming to anyone who wants to share a post. Feel free to fill out our form and we’ll be glad to take a look.